Carte de la Baye de la Table et Rade du Cap de Bonne Experance. Kaart der Tavelbaai en Ree van Kaap de Goede Hoop. 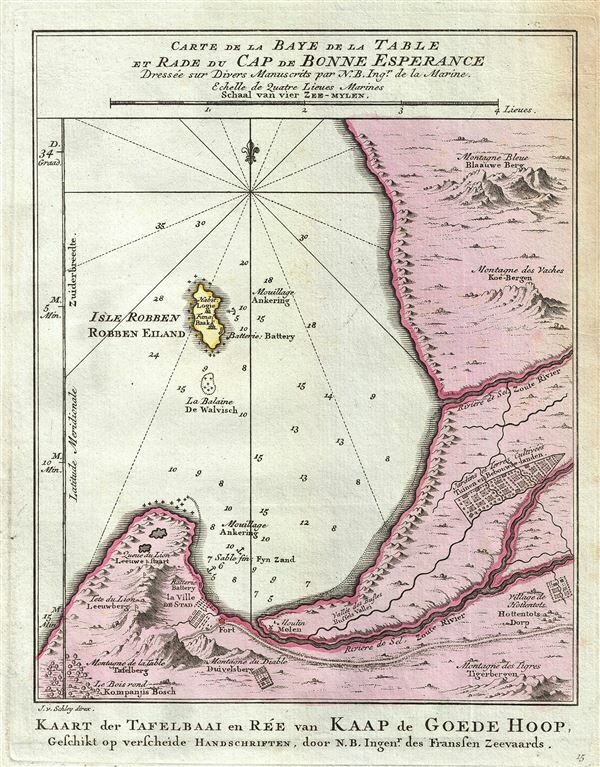 This map is a c.1773 map of the Cape of Good Hope and Cape Town, South Africa. Attributed to French cartographer Jacques-Nicholas Bellin, this map was issued for the Dutch edition of Provost's Histoire des Voyages. Beautifully rendered mountains and villages show the area in considerable detail. Shows the 'Village of the Hottentots,' Blue Mountain, Cow Mountain, Table Mountain, the City of Cape Town itself, Tigerbergen, and many other features. Some oceanic depths are indicated. Of interest is also the Isle of Robben, located centrally on the map. Long a place of exile and punishment, this island prison had a reputation for brutality and cruelty. Today a museum honors the site of so much suffering. The Dutch edition of this map is coveted as it was printed on heavier stock and to superior standards compared to most other editions. The actual printing of this edition differs from other editions in the addition of a Dutch title at the bottom of the map and in the addition of Dutch place names. The map was engraved by Schley. Dutch edition of Provost's L'Histoire Generale des Voyages. Tooley, R.V., Map Collectors Circle, 6, 22.